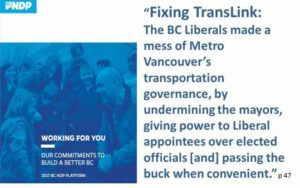 The “Liberal appointees” are still on the TransLink board, and the NDP has not yet told us when they will be removed and democratic control restored. The TransLink board is meeting on Thursday September 28 at 10 am and we will be there. Please join us! We are not that interested in talking to the “Liberal appointees” but will have signs aimed at encouraging the provincial government to fulfil their promises quickly. And we will be talking to any reporters who attend. Until a new board is in place, Minister Selina Robinson and Premier John Horgan are directly responsible for everything TransLink does. One of the urgent issues the NDP has not yet dealt with is contracting out. The decision will be made soon on contracting out HandyDART again for a minimum of 3-5 years, or bringing HandyDART in house. We believe that TransLink received direction from the previous BC Liberal government to contract out without serious consideration of any other option. TransLink issued a Request for Proposals for HandyDART contracting out and the corporations have already filed their responses. It is what happens next that is the question. 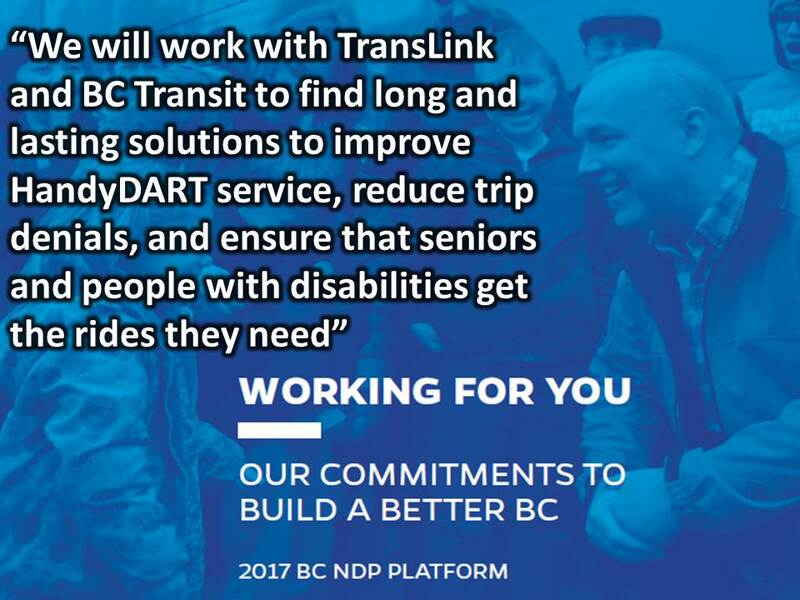 Will the NDP seriously consider bringing HandyDART in house, empower a new TransLink board of elected officials to make the decision, or will they choose “passing the buck” to a bunch of “Liberal appointees”? If you agree that the NDP should act quickly on their promises, and that HandyDART should be brought in house, please write Premier John Horgan at premier@gov.bc.ca (emails will be passed on to Minister Robinson). You can also phone the office of Selina Robinson, Minister Responsible for TransLink at (250) 387-2283. Human Rights Complaint – We believe that high quality HandyDART service should be non-negotiable. We see the poor quality of HandyDART service associated with contracting out as a human rights violation, and filed a human rights complaint. This complaint was recently accepted by the B.C. Human Rights Tribunal, and mediation is tentatively scheduled for mid-December. We will let you know how it goes! 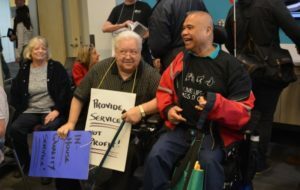 John Horgan also committed to providing funding through a special grant to increase HandyDART service hours by 5% per year for the next four years at a Metro Vancouver Alliance electoral assembly. We will be working with our allies at the Metro Vancouver Alliance to ensure this commitment is honored.